Via Plasdinam to Caetwp. Park on the field diagionally opposite the farm, close to the hedge making sure not to obstruct the gate. If the ground is wet in the field, contact Mr Parry in Caetwp farm for alternative parking. Walk up the lane until you reach Cross Keys house on your right. Through the gate and turn immediately left through another gate. There is a long carry up the rough track. Do not even take a 4WD drive up this track! As the track bears left, turn right along the edge to take off. Or via Cobbler’s Gate. Follow the track and park off the track just before the last gate. Go through the gate and follow the fence on the right and continue to the top to take-off. Bottom landing by Caetwp is in the same field as the parking. There is no bottom landing field for Cobbler’s Gate. Warning This area is used by low flying military aircraft on weekdays. Jim Mallinson, 29/05/2000, 131.8km to Honington. PG. Justin Needham, 2003, 76km. HG. A25 3m downwind at FL65 (min altitude 5500ft amsl). 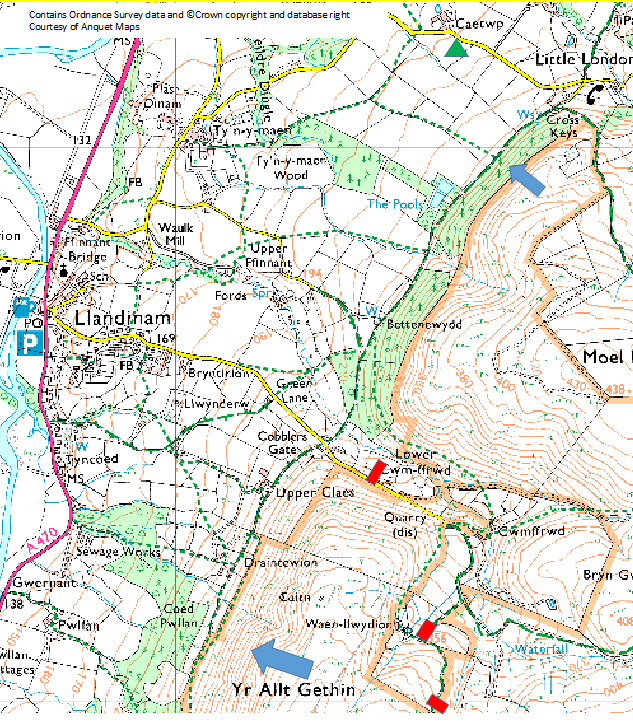 I’ve been asked to add some detail to enhance our sites guide for Llandinam, which used to be considered one of the UK’s prime hang gliding sites in years gone by, but has become irregularly used through no fault of its own. A small number of paraglider flights of over 100km have been achieved more recently. The club consider that the site has advantages that make it suitable in the right conditions for all levels of pilot. Llandinam is actually two sites on the same range of hills separated by a narrow deep valley, and runs through mid Wales behind the Cambrian mountains to the west. Mostly wild moorland, but mixed agriculture below in the bottom landing areas. It takes roughly an hour to drive to from the Long Mynd if you are already there, but can be reached relatively easily by heading towards Newtown on main roads from Welshpool / Newtown etc. Llandinam takes broadly similar wind directions to that of the Long Mynd, although won’t tolerate anything south of west very well. It is a much bigger top to bottom (almost twice as much effectively as it is over 1000ft TTB) than the Long Mynd, and somewhat steeper. The valley in front is fairly wide and the hills in front much smaller and lower, though in stronger winds wave turbulence may be a problem or blessing for HG’s. Access is up the single track lane from the centre of Llandinam, and once you go through the first gate, there is a small parking area in an old quarry suitable for half a dozen cars if parked tidily. There is supposed to be a public footpath from here heading SW along the back face of the hill, though I haven’t found it. An alternative is to continue to drive or walk up the road/track which then passes a single house and goes left through another gate and onto the moorland. Go up there until near the third gate and park. Turn right and walk alongside the fence across the moor in a WNW direction. At the front face you will find a high take off and a slightly lower one about 70ft down with a bit of a ledge between, and depending on wind strength and direction choose either. To the right of the launching area ridge there is a very small bowl effect and immediately to the NE of that the hill drops away into the valley that you have driven up, so don’t go beyond that unless you are high. To the SW end of the ridge is a nice steep area, but caution here if low as there are a lot of trees – a forest below with no-where to go if you sink out badly while not looking what you are doing. If the wind is due west, then expect the chance of rotor off the next hill in the chain (Allt Yr Hendre). There are no current official approved landing fields, and the only safe and decent sized options are a long way out down by the river. This is going to be investigated by the club and if possible specific fields negotiated. Slope landing is limited to being fairly near the top as it then gets too steep and with heavy rough vegetation so a commitment to slope land a paraglider has to be taken early if you are scratching. Once safely up soaring, there is a huge expanse for top landing, and as it rises gently behind launch unlikely to be in a rotor area from the launch hill. If you commit to going XC and fall out of the first thermal, then the top of the range of hills behind offer reasonably safe landing out options, and a track from the aerial masts. Once over those hills, depending on the direction of travel you will either fly over the Newtown valley and over Sarn ridge, or head into what appears from the air to be the real boonies, but there are loads of roads so not as bad as it may appear. For ridge soaring it is possible to cross the gaps with enough height and soar to either side. So when would you go there in preference to the Long Mynd? When there is very little wind elsewhere, and you want a big hill in a gentle WNW wind. When the wind strength is forecast to be higher to the west of the Mynd. When the thermal strengths are forecast to be better, higher cloudbase or more stable conditions (not overdeveloping to Cunim or spreadout likely). When the Mynd is busy and you want some space. Probably when the Mynd is already windy. Not when it is off south of west. The site guide does not indicate suitability of a NW wind, but looking at the topography, should still work for ridge soaring but better at Little London. Information on existing website to be checked out and confirmed as the farmer has said recently that the track is not passable even for his tractor. So at this moment please do not use, unless you are already know about it and have visited recently, and if so do tell the committee so that we can get things documented correctly.